How Can We Help With Your Pain Relief? Shantale is the first to greet you as you arrive for your visit with Dr. Dohoney. 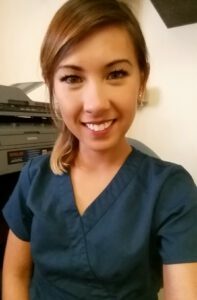 She will provide you with the necessary paperwork and answer many of the general chiropractic related questions you may have. Nashua Chiropractor, Dr. Stephen Dohoney is now accepting new patients for chiropractic care in Nashua. Call 603.886.4500 to schedule an appointment today. I'm interested in a FREE, 30-minute Chiropractic consultation. When I first came to Dr. Dohoney’s office, I had pain in my arm and neck from a pinched nerve. This pain woke me up at night and was very uncomfortable during the day. With the chiropractic therapy and spinal decompression, the pain is now a thing of the past. I highly recommend Dr. Dohoney’s treatments to anyone experiencing back and neck pain. …the right side of my neck, my right shoulder, right lower back, and hip were in pain and bothering me when sleeping at night. I would wake up after a few hours of sleep and stay awake. After my treatments, I now sleep all night, waking refreshed and ready for the day. I feel alert and rested.